They say gymnastics can be one of the good exercises you can choose from among the many. It helps your muscles and bones to be flexible making it less brittle. Meet Johanna Quaas. She may be 92 years old but she is known to be the World’s Oldest Gymnast, and she still stuns her audience when she is performing! Johanna is still capable of delivering stunning gymnast routine. She may look like a typical old lady in her 90's with white hairs, oval glasses, and wrinkled skin but she is a professional German gymnast who has made herself an elite athlete in the gymnastics world. Quaas performed at the International German Gymnastics Festival in Berlin in June 2017. 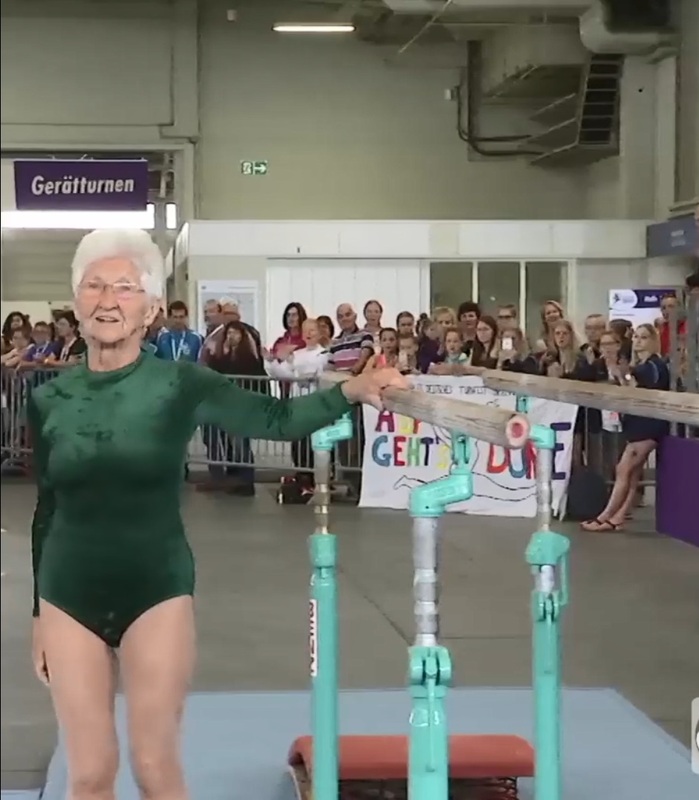 While most of the athletes half her age are still finding a hard time in performing tricks on a parallel bar, this old lady showed her strength, talent and years of practice like no other. She has always finished her stunts in a graceful manner and ranked first in the previous years. In this event, she is awarded as the fourth runner-up, but it is still something to be proud of considering her age and talent. The audience was astonished by acts like she is only a teenager doing the gymnastics with very soft bones. The Guinness World of Records had certified Quaas for being the oldest gymnast in 2012 when she turned 86. After the awarding of the certificate, she did not stop doing the gymnastics and continued to pursue her passion in the said sports. She also said that she would not quit gymnastics and she will continue to perform until her last breath. This Lady had a very good posture though she is already 92 and her bones are still strong! With her video being shared on Facebook, she became viral and gained lots of praises form the netizens who love her.